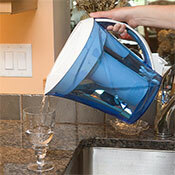 The Zero Water Filter Pitcher has been discontinued. 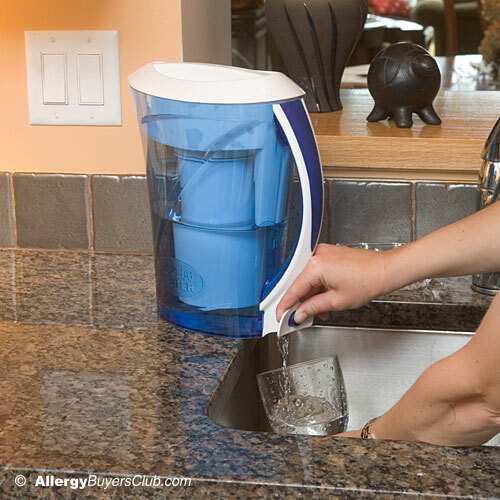 Our Zero Water Pitcher is the only filtered water that meets FDA definition for purified bottled water and features a 5-stage filtration system to remove hundreds of contaminants. Expert advice from knowledgeable staff. 30-day no hassle return policy. Ratings & reviews. This is no ordinary water pitcher which you would not suspect by its price. It has a five stage filter, unheard of for a pitcher type water filter, and it can be used as a dispenser right inside your refrigerator. The Zero Water Pitcher removes chlorine taste & odor, suspended solids such as dust and rust, metals, non metals and organic compounds as well as radiological contaminants. The water pitcher also sports a built in water tester, so you can be assured that your water is clean and will give you a good indication of when to change the filter, usually about 22.5 gallons. Assembled in the USA. Wants convenient water pitcher with a specially designed push button to disperse clean, fresh, chilled water straight from inside the fridge. Wants an pitcher water purifier with 5 effective filtration stages to remove hundreds of contaminants from your tap water. Prefers a cheaper and environmentally friendly alternative as compared to buying bottled water. 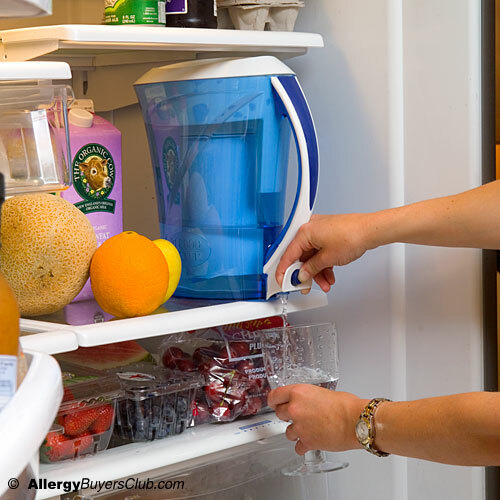 One-chamber pitcher features a lid with a pour spout and exclusive in-fridge push button dispenser so you can enjoy clean, crisp and clean water straight from the refrigerator. It is essential to change the filters with a reading of "006" on the included TDS meter in order for the product to continue to perform as represented. The longevity of the filter may vary based on local water conditions. Filter cartridge life is based on household water consumption and inlet water quality. How often the cartridge needs to be replaced is determined by how much water you put through the system and how hard the cartridge has to work to clean the water you put through it. The more dissolved solids in your water (or the higher your TDS reading), the shorter the cartridge life. Under laboratory protocols, a single filter was rated for 22.5 gallons in the certification process. The contaminants or other substances removed or reduced by this water treatment device are not necessarily in all users' water. When removing the TDS meter from pitcher storage compartment wait approximately 5 minutes allowing the meter to reach room temperature for accurate reading. 1. Remove the cap from the end of the TDS Meter. 2. Push the "ON/OFF" button. The meter should read "000". 3. Place the end of the meter in one inch of water. Do not fully submerge the TDS Meter; this may short circuit the battery. 4. Wait a few seconds for the reading to stabilize. To keep the reading on the display, press the "HOLD" button so that you can read the number when you remove the meter from the water. There is a nice handle design which makes pouring and carrying comfortable and easy. The filters are rather big and more pricey compared to some of our other water pitcher filters but they do last up to 25 gallons depending on water conditions. Have to carefully make sure that no water enters the compartment where the TDS Meter is sitting in. The meter can become damaged if it is sitting in lots of water over time. A water filter pitcher may be limited in their performance compared to a more costly countertop or under sink water filtration system, but it is a great alternative for those who are satisfied with removing the most common impurities in their water supply. As we all know, not all tap water is perfect and there may be some instances where due to higher levels of specific contaminants (such as arsenic) it may be necessary to install a countertop or under the sink water filtration system. When compared to traditional water pitchers out on the market today, we found Zero's 5-stage filter to be more effective and resulting in better tasting, crisp and healthy drinking water. Its stylish design and thoughtful dispenser made the Zero a perfect fit in the refrigerator without taking too much space. Set of 2 replacement filters for the Zero Water Pitcher. Depending on water conditions and usage, each filter lasts around 25 gallons. Availability: Ships out within 1 - 2 business days.